Eight months after Peter Jennings signed off of World News Tonight, ABC News said it would create a dual anchor format for the show. Elizabeth Vargas and Bob Woodruff will take over the evening newscast. It isn't clear whether they'll co-anchor the half-hour broadcast, or split duties on a nightly basis. The two have been tag-teaming WNT for months. The anchors, both in their early 40's, will give the show a youthful makeover and should heep the demo-mongers happy for years. Now that two of the three evening newscasts have had their jobs filled, all eyes are on CBS as they seek to permanently replace the utterly replaceable Dan Rather. Recent speculation has CBS once again wooing Katie Couric to helm their Chair. Four half-hours of unseen Chappelle's Show sketches will resurface this spring, Comedy Central says. The comedian had shot about two hours worth of sketches before his much-publicized freakout earlier in the year. Since Chappelle hadn't shot his wraparounds before he skipped town on the show, it's unclear how the network will package the skits. Clearly, though, Comedy Central expects- and should receive- big ratings. The Oprah Nation has struck again. Her Thursday visit to Late Show with David Letterman earned the show its biggest audience in more than a decade, an estimated 13.5 million viewers. It was Winfrey's first visit to Letterman in 16 years. Nails-across-a-blackboard quasi-chef Rachael Ray's talk show has already been sold in 70 percent of the country. The production company is predicting a smash hit. ...the big question is, will Americans, in group form, be able to stomach Ray's overly enthusiastic verve five days a week? To build her profile, she'll appear on sister show Oprah at least monthly leading up to her launch this fall. The show made news recently when it knocked yakker Tony Danza off of its New York and Philadelphia stations for the fall, seemingly authoring that show's demise. 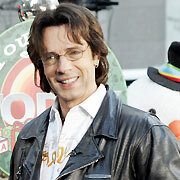 With his absence from the pop charts leaving him starved for the spotlight, Rick Springfield is back as Dr. Noah Drake on General Hospital. Springfield was looking for innovative ways to promote his new album, The Day After Yesterday, and started pursuing guest spots on several soaps. When his old show General Hospital made an offer, he accepted- even though they won't let him sing. He first played the role in the early '80s, when we all needed Jessie's Girl. ...why can't I find a woman like that?